One of the world’s most exclusive restaurants, Le Club 55 sits on St. Tropez’s white-sanded beach of Pampelonne. It has been known to serve many famous people, but all customers are treated the same… if you’re lucky enough to even get a table, that is. You should definitely try to get yourself a reservation at this beach club if you’re planning a trip to St. Tropez – it’s a once-in-a-lifetime kind of experience! St. Barts is a well-known vacay spot, in fact it’s got two different beaches on my list! Saline Beach in St. Barts is a bit rougher than some of its other beaches but has the luxury of being quite private and very obviously tranquil and beautiful. This is the second St. Barts beach on my list. Only accessible by boat or a 25-minute long hike through rugged terrain, this beach is so secluded it might as well be considered private. Colombier is perfect for swimming, snorkeling, sailing, or just admiring the view. Cambridge Beaches is a cottage colony perfect for a romantic getaway or a family escape. You will be treated like a celebrity by its staff who will cater to your every need. Dine at the gourmet restaurant or visit its spa or spend the day on one of its five private beaches. These exclusive accomodations ensure you the luxurious vacation you desire. Rania is an exclusive private island experience. You get your own island home hidden somewhere in the Indian Ocean, private yacht, personal chef, and staff. This is the ultimate sanctuary, oasis, getaway – whatever you want to call it! This experience has luxury (and “$$$”) written all over it. Is there such a thing as too exclusive? Because if so, these places probably qualify! What do you think the most exclusive beach destinations in the world are? Would you have guessed St. Barts, Bermuda, the Indian Ocean and France? As always, let me know! Do you have expensive taste?… I mean that literally. If your taste buds crave luxurious combinations of the finest ingredients that your wallet cannot afford, you’ll be drooling at this list of the most expensive desserts in the world. From Serendipity 3, this is one “hot” chocolate that you won’t forget. Not only is the dessert itself valuable with cocoas from 14 different countries and 5 grams of 24-carat gold, but the serving goblet is banded with gold and decorated with diamonds. So how much will this tasty treat cost you? The answer is $25,000! This is no ordinary pudding, ringing in at $34,000! It is layered with biscuit joconde, champagne jelly, and dark chocolate and topped with gold leaves and a 2-carat diamond. Although this cake has yet to be sold, its original purpose was to encourage more people to wear platinum jewelry. I’m not sure if this makes me want to wear more platinum or just simply stuff my face with cake. Either way, this cake is a delectable dessert draped in all sorts of platinum pieces and topped with edible platinum flakes. It’s very pretty and certainly costs a pretty penny, rounding in at $130,000! So, we’ve come to #1 and already surpassed $1 million with #2. Any guesses how much this festive cake topped with 223 small diamonds that took a chef 7 months to prepare might cost? Well, the answer is $1.65 million. So, there you have it! The world’s most expensive desserts, topping the list with a $1.65 million fruitcake (of all things, fruitcake? Really???). Gabrielle Vizzavona French wine expert, member of “French Sommelier Association”, and TV host taught me how to taste wine like a pro. Learning it was an adventure for me, and truly deepen my wine appreciation for both wines and winemakers. We started with wine basic senses of looking at wine, smelling, tasting it and of course lots of spitting!! Gabrielle described general characteristics of wine with the range of flavors, and aromas. I learned that wines have four basic components: sweetness, tannins, alcohol, and acidity. A good wine will have a good balance of all for characteristics. Aging will soften tannins. Acidity will soften throughout the life of a wine as it undergoes chemical changes which include the break down of acids. Fruit will rise and then fall throughout the life of a wine. Alcohol will stay the same. All these factors contribute to knowing when to drink a wine. Throughout her adventures international wine taster Gabrielle found some amazing wines almost everywhere. Here is her favorite California & Oregon wine list recommendation for wine lovers. Beautiful specimens from around the world are arranged over ice in the back of the austere room, where waiters invite customers to claim their entrée before it’s reeled in to the kitchen. Great atmosphere, very good service, delicious food, fresh tasty fish. Mediterranean loup de mer, $46/lb. 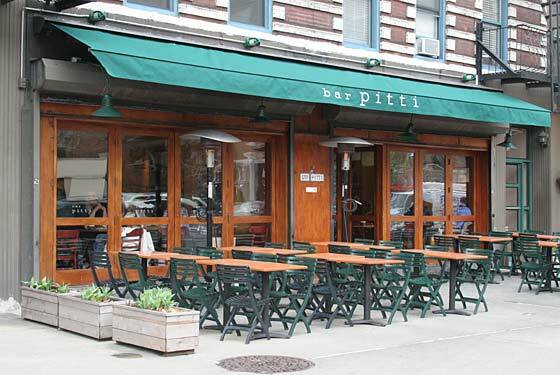 A downtown casual Italian standby with exceptional outdoor seating. The food is to die for and there is such a pretty atmosphere! Affordable, comfy simple Tuscan fare and draws an arty, fashion-conscious notable crowd. Unforgettable Cappucinos and Paninis at Via Quadronno! Via quadrono & its sister café Bottega del Vino have been recently rated “excellent” for their unforgettable superb cappuccinos, espressos, mochas, and coffees, steeped in Italian tradition. You can also find sensational hard to resist paninis. * My favorite is “La Madunina”, prosciutto, fresh mozzarella, black olive paté, and fresh tomatoes $13.50.